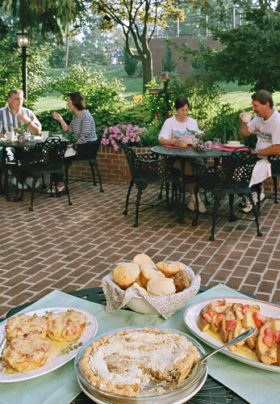 Breakfast is a special part of your stay at the Brickhouse Inn, our luxury B&B in Gettysburg, PA. Enjoy a hearty cooked breakfast served in our two dining rooms, or in the warmer months you will delight in having breakfast outside on our patios overlooking the gardens, surrounded by the sounds of waterfalls and birds. We generally have two sittings for breakfast: 8:15 a.m. and 9:15 a.m., or in the winter: 8:30 a.m. and 9:30 a.m. However, if these times don’t suit you, ask us for an alternative. Each day at our Pennsylvania inn the menu changes, offering fresh fruit or parfait and a savory or sweet main course. Don’t forget to leave room for our breakfast desserts – our signature, home-baked shoofly pie and other mouthwatering choices, such as raspberry almond tart, lemon tart, or blueberry buckle. You will leave the table thoroughly satisfied and ready to take on whatever adventure awaits you in the coming day. We select the freshest fruit, vegetables and eggs from local farmers’ markets and are proud to be in the finest apple and peach growing region of the Mid-Atlantic area.